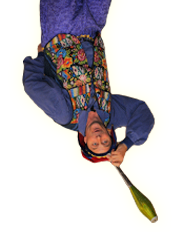 Since 1986 Nick Newlin and Joanne Flynn have been bringing their irrestible blend of humor, heart and teaching to children. Focusing on literacy, Nicolo Whimsey brings poems, stories and music to students in a way that inspires them to read, write, and think creatively. Additionally, Nicolo Whimsey inspires children to be kind to each other, and to persevere in their endeavors with joy and dedication. Nicolo Whimsey does all this while keeping kids and adults laughing! 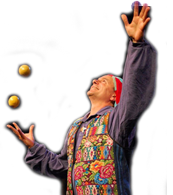 Nicolo Whimsey has performed at The White House, The Kennedy Center, and The National Theatre as well as countless schools, day care centers, libraries, Summer Camps, festivals and corporate events. Nick Newlin has a BA with Honors from Harvard University and an MA in Theatre from the University of Maryland. He has been a recipient of Maryland State Arts Council Artist-in-Education funding for 30 years, and a teaching artist with Folger Shakespeare Library for 20 years. You will seldom find someone as down to earth and funny with such a fierce intellectual and social dedication to the betterment of children’s lives through performance, example and arts education. Nick’s performances are for children, but he is also the author of an 18-book series for teachers and older students called The 30-Minute Shakespeare. He is also an accomplished musician, playing keyboards and accordion with Zydeco Jed and other bands. Nicolo Whimsey has a CD of poems and songs for children entitled My Whole World Grows, available HERE.